The Trick of the Month has become a staple of BMX Freestyler and Global-Flat. The Tradition shall continue on for the year of 2010. My goal over the years was to help riders out there stay motivated learning tricks and pushing the envelope that new variations would be thought of at the same time. 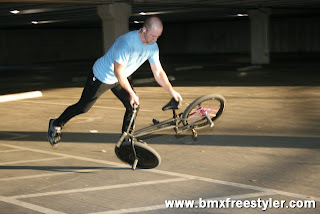 All tricks in the Trick of the Month are a Beginner/Intermediate Level. That way all rider can participate or make attempts. Here is how Trick of the Month works. Every month there will be a new trick in the spotlight. You can do 1 of 2 things. 2. Make comments to help or inspire each other. Variations are a good thing! So if you got something unusual and different please share with everyone. 09 was a great year for participation. I hope to keep the tradition going with some new tricks thrown into the mix along with some old faithful.